Should Scientific Discoveries Made in the Islands be Given Hawaiian Names? Hawaiian language experts, students, educators, and astronomers joined forces to name new astronomical discoveries made here in Hawai'i. Hawaiʻi is at the center for scientific research from the oceans to the skies. But when it comes to scientific discoveries made in the islands; there’s a question that’s getting more attention: should they be given Hawaiian names. HPR’s Kuʻuwehi Hiraishi has more on the story. 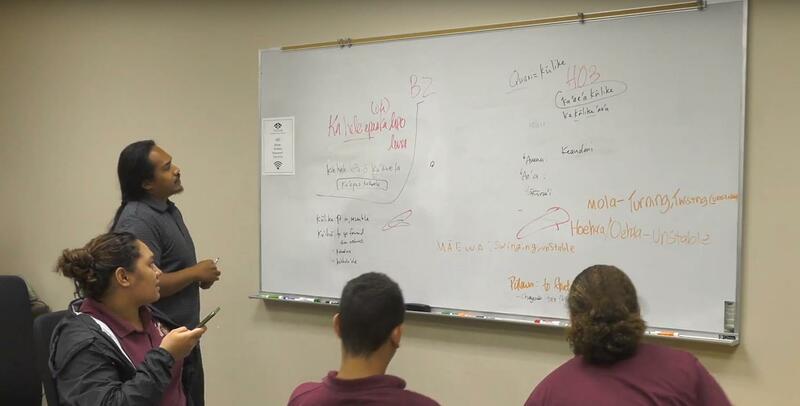 A pilot program is allowing students to give Hawaiian names to astronomical discoveries made on Mauna Kea and Haleakalā. Kaʻiu Kimura is Executive Director of ʻImiloa Astronomy Center and leads the program. She says it just makes sense. Hawaiian language students contemplate the final series of name choices for two new astronomical discoveries. KIMURA: No ka mea inā nō ʻaneʻi kēia ʻike inā ʻimi ʻia a loaʻa ia ʻike ma Hawaiʻi, he mea nui ka hiki ke hoʻano a mahalo i kahi i loaʻa mai ai kēlā ʻike. She says if discoveries are being made in Hawaiʻi, itʻs important to honor that sense of place. The program kicked off with a gathering of Hawaiian language experts, astronomers, and students to produce names for two newly-discovered asteroids. Doug Simons, Executive Director of the Canada-France-Hawaiʻi Telescope, was there. He says prior to this program, the naming protocol could be pretty dry. Doug Simons, Executive Director of the Canada-France-Hawai'i Telescope, give Hawaiian language students a tour of the telescope. And it’s often an ambiguous mouthful like 1I/2017U1. “So the idea of just sort of shattering all of that and providing Hawaiian names that are unique to the properties of the object is completely new,” says Simons. Astronomer Heather Kaluna gives Hawaiian language experts and students an astronomy lesson. 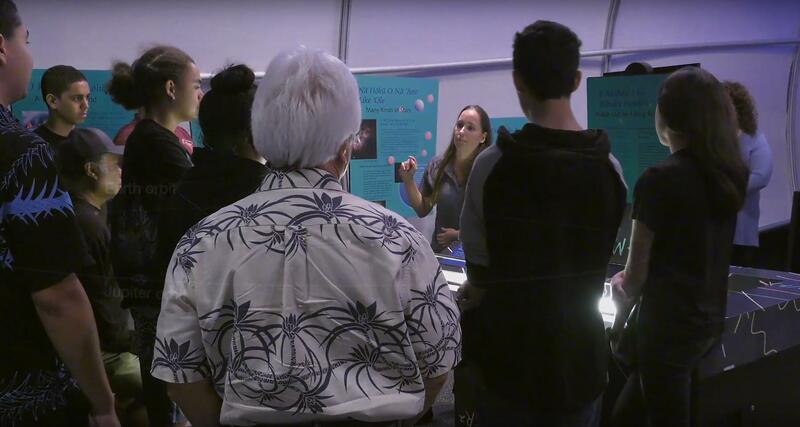 At the gathering, astronomers did their best to teach Hawaiian speakers about the scientific properties of the asteroids. ʻŌlelo Hawaiʻi experts then delved into the art of naming objects from a native Hawaiian perspective. KIMURA: Kēia ʻano kūʻikahi ʻana me ka poʻe ʻepekema e ʻimi nei i ka ʻike hou ma Hawaiʻi, he hōnuanua hou loa kēia no kākou ka poʻe ʻōlelo a no ko kākou hoʻonui ʻana i ka hoʻohana ʻia ʻo ka ʻōlelo Hawaiʻi. Kimura says this collaboration with Hawaiʻi astronomers is a very new platform for speakers and an opportunity to normalize ʻōlelo Hawaiʻi. Hawaiian language students delve into the art and craft of naming objects. The group voted on the names Kamoʻoalewa and Kaʻepaokaʻāwela. Both have to do with the nature of the objects---and the direction of their orbits. Those names are currently before the International Astronomical Union, tasked naming astronomical discoveries. “You know, don’t be surprised when you see more Hawaiian names coming up on the world news and you’ll know where they came from just because they’re Hawaiian. It’s very simple,” says Simons. Telescopes atop Mauna Kea on Hawai'i Island. Hawaiian language students chosen to participate in this program hailed from Hawai'i Island as well as Maui - both home to telescopes. KIMURA: He manaʻolana ko mākou e hiki ana ke hoʻomau ʻia kēia hana aʻole ma ke kilo hōkū wale nō, akā ma nā ʻano noiʻi ʻepekema like ʻole e mālama ʻia nei ma Hawaiʻi no. Kimura says the group hopes to expand its work beyond astronomy to all sorts of scientific discoveries being made here in Hawaiʻi.